At SEEK, in preparation for our upcoming 8th Hackathon, we introduced Upskill sessions to teach fellow seekers new skills to help their hacking endeavours. 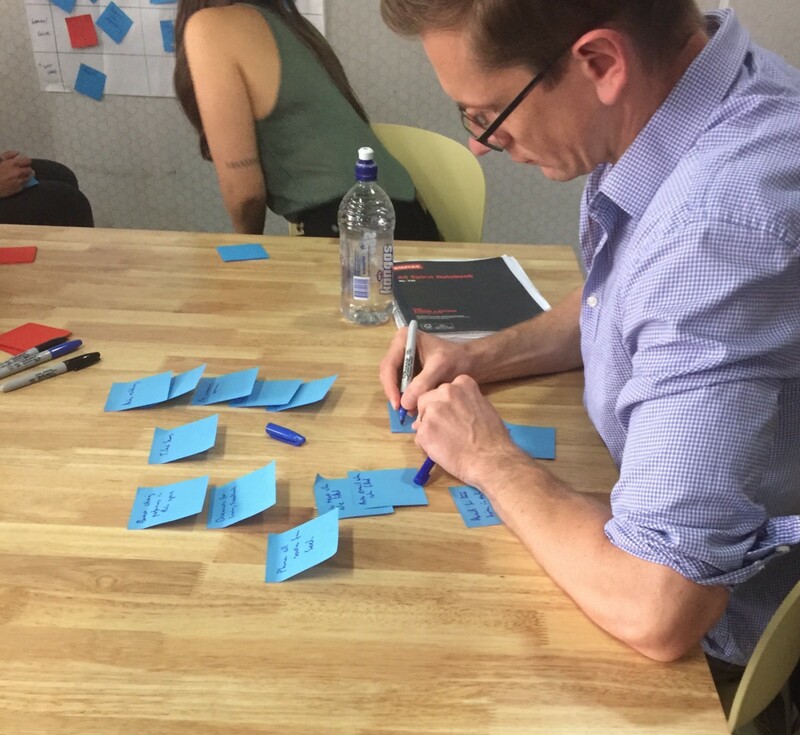 We kicked off these sessions with a 2-part Design Thinking workshop to broadly share Design Thinking with the rest of SEEK and promote a customer-centric approach in everything we do. 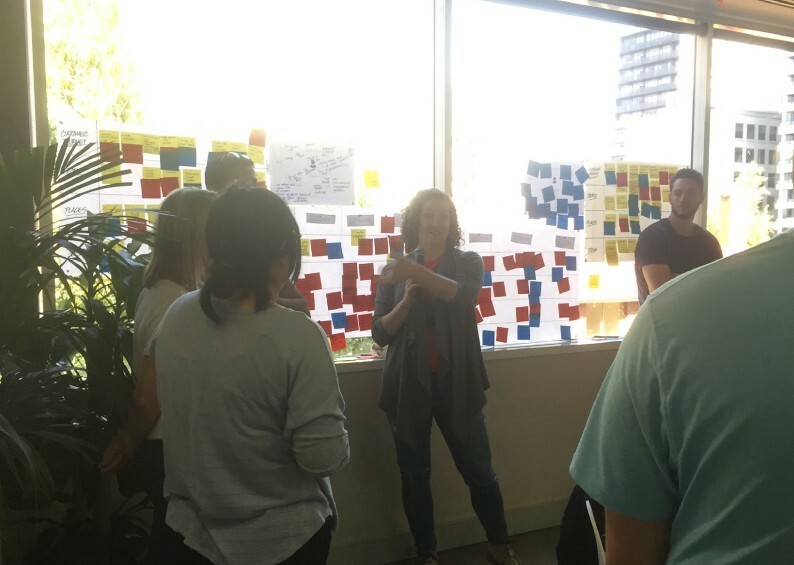 In part 1 we gave an overview of what Design Thinking is. This week we dive into the practical exercises we taught in the workshops. We use the Double Diamond structure to understand customers and their problems and explore creative and innovative ways to solve their problems and delight them. 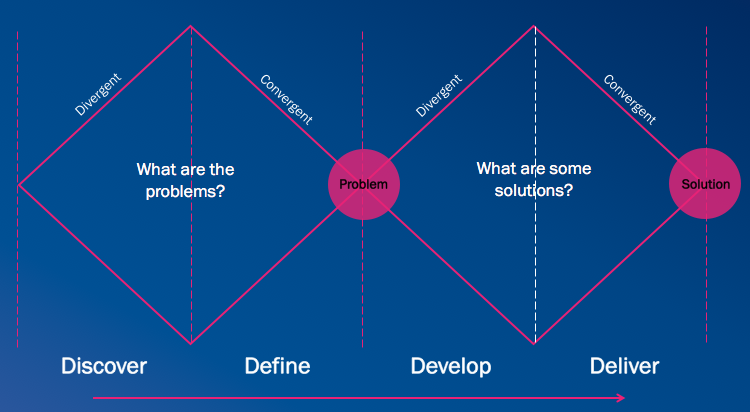 Using the double diamond, you approach problems and solutions by using 2 different types of thinking: divergent and convergent. Let’s look at each phase, and the Design Thinking exercises that can help with each. In this first step, we practice divergent thinking. This means we open our minds and consider everything about our customer, constrained by nothing. You need to get up from your desk and go talk to customers. Interview them, watch them use your products, listen to them and learn everything you can about them. This work will help you build empathy. 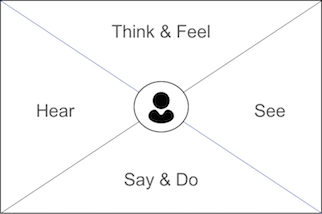 Once you’ve met real users, document what you’ve learned by creating empathy maps and customer journeys. Empathy maps capture what our customers are saying, doing, thinking and feeling, hearing and seeing. These should be based on what you have heard from your customer — no making it up! Next we develop customer journeys to map out their experience over time, identifying relevant touchpoints. This is a timeline of the activities customers undertake with your product — note the places, tools or people they interact with. Now that we understand what the customers feel and what they do, we start to use convergent thinking. This means we begin to focus on key areas now, starting to converge on specific experiences within the customer journey. As a team, we consider the delight in their experiences, but also the pain-points. We vote and agree on the key areas that need a solution. In this activity we overlay some of the pleasure and pain-points we learnt about on the customer journey. Use red post-it notes to mark the Roses (pleasures) and another colour to represent Thorns (pain-points). Take the pain-points (thorns) and re-frame them as questions for us to try and solve. Pick a few problems to solve and be ambitious in turning the problem into a delight. For example,instead of asking “how do we stop people using their mobile phones in the cinema”, we can turn it into an ambitious HMW by asking “how might we make people using mobile phones in the cinema provide a better experience for cinema goers?”. Rather than stopping the use, could we solve the core problems (interruptions, distractions) in innovative ways. At this point we are half-way through the double diamond and have decided on the problem(s) to try and solve. In this third step, develop, we practice divergent thinking again. This means we begin to open our mind and start ideating — generating a list of whacky, amazing, creative, and innovative ideas. 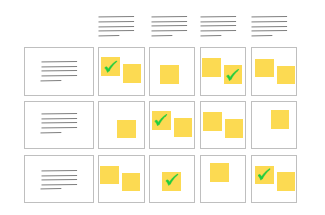 As a team, we’ll consider everything, and focus on generating as many ideas as possible. 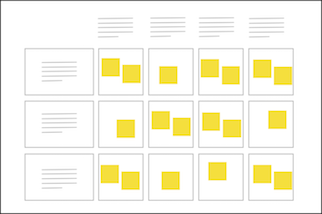 There are no bad ideas — quantity over quality. 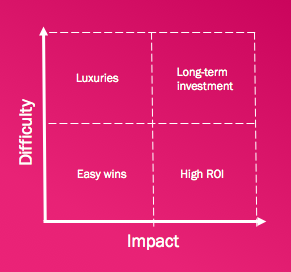 Take our HMW’s, and use a Creative Matrix to brainstorm heaps of possible ideas — the aim is quantity!! HMW’s go along the top, and on the left are a few guiding considerations to direct you. It’s important to have some broad themes like Technology or people. However, also use some narrower themes like social media or gaming, as this will help force you to think outside the box. Don’t forget to add a wildcard too, to catch all those stray ideas that don’t fit anywhere else. Think outside the box on this one! 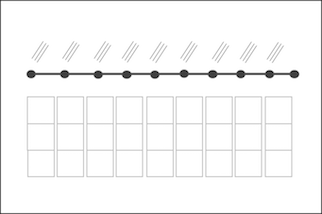 When running this exercise, consider introducing rewards for the most ideas. We gave a few chocolates to the team that generated the most ideas, and not just the free chocolates readily available around SEEK, but the good stuff. In this last step we practice convergent thinking again, focusing on what we can actually deliver and which solutions will solve the users’ needs. We vote and agree on the key areas that need a solution. Converge by voting on some of the better or intriguing ideas, that we’d like to hear more about. Each person in the group votes for a maximum of 2 ideas each. A common rule in improv, is never to say no. You keep the conversation going with “Yes, and…” — keep building. In your groups, take turns in explaining your ideas. Then respond, “Yes, and…” to add to the idea and improve it. Also — no buts! There’s always one person who tries to get around “yes and…” by saying “but…”. Now that we’ve explored Desirability in an unconstrained way, we’re ready to start converging on the right solution. 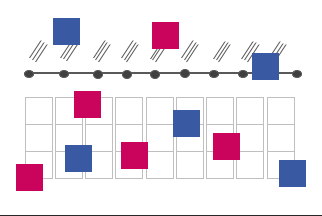 In your groups, plot your ideas on the impact/difficulty matrix and decide which ones you want to pursue! Very difficult and low impact problems aren’t necessarily a write off — these are luxuries that some users may be willing to pay for. Thanks to Rob Alford for championing the Hack Skills sessions, and hosting this workshop. The planning, organising and facilitating involved Nate Harrison, Sophie Hine, Mimi Turner, Tad Obiegly, Taryn D’Souza, Jo Piechota, Campbell Love, Aoife Johnston and myself, Kayla Heffernan. Thanks to Rob Alford and Vedran Arnautovic.